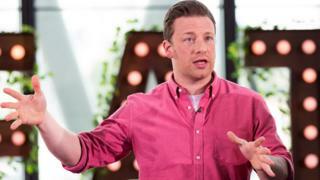 Jamie Oliver has been accused of cultural appropriation for calling a new product "punchy jerk rice". The decision to label the microwavable rice "jerk" has been criticised, because the product doesn't contain many of the ingredients traditionally used in a Jamaican jerk marinade. "I'm just wondering do you know what Jamaican jerk actually is?" MP Dawn Butler asked the celebrity chef. He said he used the name to show where he drew his culinary inspiration from. Jerk seasoning is usually used on chicken. The dish is often barbecued. Jerk rice isn't really a thing, which is why a lot of people reacted angrily to Jamie's new creation. There's no such thing as jerk rice apart from what Jamie Oliver has concocted. That's her point. Anybody from any nationality can eat anything they want, there are just some dishes that are best left alone and enjoyed how they're supposed to be made. I am still not over this Jerk Rice nonsense. Just no Jamie Oliver NOOOOOO!!!! Cultural appropriation: Exchange of ideas or the politics of power? People have also questioned the ingredients in Jamie's rice. There are many variations of jerk marinade, but most contain allspice, scotch bonnet chillies, thyme, soy sauce, ginger, lime, garlic, onions and sugar. Jamie's "punchy jerk rice" mixes garlic, ginger and jalapenos "to create a jerk marinade with attitude". It's like stamping a Union Jack on "traditional fish and chips" except the fish is a salmon en croute and the chips are crisps. It's Labour politician Dawn Butler's tweet about the rice which seems to have really started a discussion though. Plenty of people have accused the MP of making something out of nothing. A Conservative MP was one of them. And others echoed his views. She’s gonna blow her lid when she finds out he’s not even Italian. I just wish we could all enjoy the bests bits of each others cultures without accusations being thrown around. So only Greeks can run in the London Marathon ? It's fair to say people are divided. Responding to the criticism, Jamie said in a statement: "I've worked with flavours and spices from all over the world my whole career, learning and drawing inspiration from different countries and cultures to give a fresh twist to the food we eat every day. There was a similar argument earlier this month about a range of Indian food sold by Marks & Spencer. Food writer Mallika Basu questioned the ingredients used in a "Bengali turmeric curry". I grew up in Bengal, head back regularly and I have no idea what Bengali Turmeric Curry is. With celery seeds, tamarind and coconut no less. M&S told BBC Radio 4 at the time: "The curry kit was developed to be a traditional Bengali malai turmeric curry, a celebratory dish, popular with the British population in Kolkata." But Mallika thought the supermarket had a "responsibility" to do better, when asked whether M&S was just catering for "British tastes". "We're not in the 1960s anymore, we're not in the 1950s. People's opinions, tastes and knowledge about what constitutes regional curries has evolved tremendously. "When you're going into really specific regions and you're giving things names that are obviously trying to give these things a more authentic regional gloss, I'm afraid that just doesn't cut it in today's world anymore." "It matters that when you're selling products of a certain culture and nation, you show a bit of respect and get to the bottom of what should feature in that recipe"